This preliminary report analyses the data collected on community development projects in Zambia conducted between 2013 and 2018. 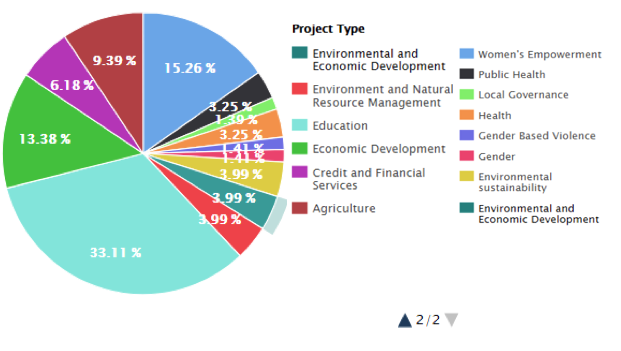 The projects are analysed with the Senca Explore system with an emphasis on funding trends and project types. In doing so, the analysis presents a glimpse of the community development landscape in Zambia. Development Priorities: 1. Economic Diversification and Job Creation 2. Poverty and Vulnerability Reduction 3. Enhancing Human Development 4. Reducing Developmental Inequalities 5. Creating A Conducive Governance Environment for a Diversified and Inclusive Economy. The Zambian economy has experienced high economic growth and has one of the fastest growing populations. Yet poverty levels remain high. Under the Ministry of Community Development and Social Welfare, the Department of Community Development is tasked with alleviating extreme poverty and suffering, which they do through four programmes: a) Food Security Pack b) Women Empowerment, c) Self Help Initiative and d) Non-Formal Education and Skills Training. Our analysis indicate a strong correlation between the projects that were funded and the over-all development priorities of the country as well as the need to enhance and cooperate with local government in the implementation of community development projects. Community Development is a developmental strategy that is democratic, locally owned and community driven. The projects in this set of data have been identified for the centrality of communities in their development objectives. They have enhanced the social, economic and political conditions of communities and have assisted in upskilling communities to become drivers of their own development. Funding for education took two forms: funding directed at building institutional capacity in both local government and schools for the delivery of quality education to rural communities and funding directed at increasing the accessibility of schools in rural communities, for example, by providing bicycles to scholars. The World Bank was the biggest funder of “Education” community development projects in Zambia and schools were the largest beneficiaries. Although Zambia has experienced high economic growth, the benefits of that growth have largely been felt by urban populations. The urban-rural divide is not only felt in the lack of infrastructure in rural areas, but in the limited opportunities available to rural communities. Unequal access to education is also gendered, with women attaining education at a lower rate than Zambian men. Investment in education is a strategy to promote more inclusive growth and development. The Seventh National Development Plan of Zambia identifies education as a key tool in achieving its objectives. ‍Projects of this type included increasing access to education, improving livelihoods of women (for example, through cash transfers), reducing risk to HIV infection amongst vulnerable populations and advocacy with and within communities to address harmful social norms affecting women. The World Bank has been the largest funder of “Women’s Empowerment” projects in Zambia, followed by USAID. Funding for Women Empowerment directly correlates with the specific objectives of the Zambian Department of Community Development. “Economic Development” projects overlap with projects providing financial and credit services and supporting entrepreneurs, agriculture and natural resource management for improved livelihoods. The impact of economic development can be felt at a local and national level and is essential to Zambia’s broader developmental objective of diversifying the economy and promoting inclusive economic growth. The World Bank was the largest funder of Economic Development projects, followed by IFAD. The World Bank is the largest source of funding for community development projects across Zambia in this set of data. The projects sponsored by the World Bank span the education, environmental and agricultural sectors. The largest project funded by the World Bank was “Girls Education and Women’s Empowerment and Livelihood Project”- a project demonstrating an intersectoral (education, local governance and finance) approach to community development. A key element in all projects funded by the World Bank is project monitoring and evaluation. This process enhances the capacities of implementing agencies to manage projects which is key to the success of projects and a determinant of further funding. The projects analysed all demonstrate the need for interdepartmental and intersectoral strategies to community development. Where the country in question has developmental goals, external funding can play a key role in assisting governments to achieve their objectives. With community development specifically, the intrinsic goal is to develop self-reliant communities with a good relationship to local government structures. Zambia’s challenge of uneven development and social and economic inequality is not exclusive. Global inequality, intra-country inequality and the ramifications of both remain part of the major challenges facing governments and international regional bodies. Community Development, with a specific focus on infrastructure and increasing social mobility, is a means of directly addressing the unevenness of development. For example, where small scale farmers and entrepreneurs are unable to access financial and business support due to them being geographically isolated or unable to meet the requirements of popular banks, economic development projects in Zambian communities offered alternative sources of support. Communities were consequently exposed to new opportunities to grow their local economies. Immediate relief strategies, such as cash transfers in the women’s empowerment projects, are tied into broader development goals like improving livelihoods and enhancing systems of local governance. Community development to reduce social and economic inequality requires investment in social goods, as demonstrated by the overwhelming investment in education. The involvement of communities in the planning and implementation processes is key to developing an optimal approach in a specific community and to ensuring the success of projects in communities. Thank you! You’ll receive an email shortly confirming your subscription.